Want to get more traffic to your blog? How to get 120,000 visitors to your blog in a week? How to improve traffic to website? How to get more readers to your blog posts? And the quick answer is; you need to create a video of your blog post. Let me prove it with very common but most familiar & most popular examples. Start by thinking about what you wish to achieve with your video content marketing strategy. I hope you get help from this article and structure for developing a content marketing strategy. Content is the king, so it's necessary to frequently review your content marketing strategies. Video marketing is one of the most influential marketing media online these days and I strongly believe that it will keep growing. Videos are among the most adaptable method every content marketers can plan to stay ahead for driving targeted traffic. By 2020, the online published videos will consider for more than 80% of all the organic traffic. Then so, the video content marketing strategy is a fundamental method to execute for all companies. A content strategy and content strategy marketing methods are clearly distinct from each other. The video marketing is one the advanced methods for promoting your quality content. 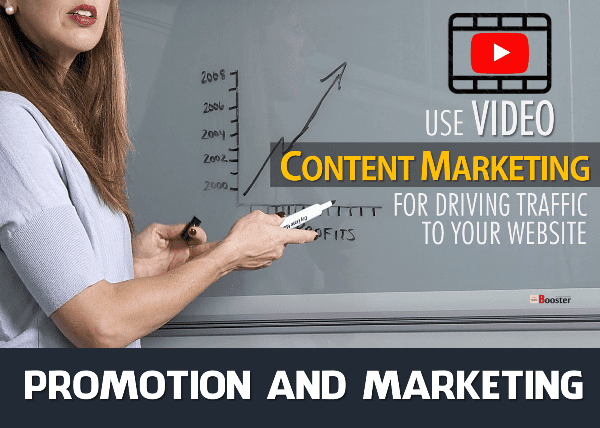 Most of the online businesses are adapting to video content marketing as a powerful and effective content marketing & promotion strategy. People also ask; How do you promote your blog? What is the content promotion? How do you promote a product? What are the different types of promotion? All the answers will be described herein this page; that includes a number of methods of promotion used in marketing that you can use to get more backlinks, social shares, and traffic from your content and ultimately that'll make your post viral on social media. We all know that YouTube is the second largest search engine in the world & the reason behind this; the most of the people tending to prefers watching a video than reading the text. Due to this, the video has more 'engagement-rates' than text. In addition to this, we all know that the human mind understands the language of pictures (flow of pictures = video) more than a text. Videos are one of the best ways to fire your content. So this is more creative & most effective way to increase traffic to your blog. Here I am enlisting some very important points that how you can use video to drive traffic to your blog. But before that remember one thing, you make sure your video should NOT be as helpful as your blog post as it may create a reverse effect & people just stick to your video & ignore your blog post. Stay connected you will get the idea. Here are 9 suggestions to get you started on your way to set your great social media marketing content strategy for your blog or website. If you haven't subscribed our newsletter, then you must follow our blog to get the tech updates and social deals directly to your emails. Recently I have published, [Fixed] Video Lagging - Play HD Videos on Slow Computer // Fix YouTube Lagging/Skipping/Stuttering/Buffering. But today I want to share some best ways about video publishing making an effect on your traffic and content strategies. 1. Call with a teaser video. The best way to get readers attention to your blog post is to post a teaser video on the YouTube. This helps readers to get some idea about your current and future post. Create your own Channel & post a teaser video of your upcoming blog post in such a way that users will get excited to read your upcoming blog post. The video should include the information in short about the things, they are gone get from your blog post. Just make sure the length of the video shouldn't exceed more than 60-90 seconds. Don't forget to add a link to your post in a video description so that they can make use of it to know more about your post if they want to do so. 2. Curate video content to engage. There are different ways to make curate videos. You can ask the company professionals to tell about their visions. Another way is to select a topic & do some video research and describe the content of your research. 3. Marketing with 'How-To' tutorial videos. If your blog post is of 'how to' kind of, then explaining it through tutorial videos would be a great idea, as it practically shows all the steps. E.g 'How to solve a maths problem' or 'How to cook a dish' etc. Yes, demonstrate the tutorials with step-by-step guide in your videos. It makes people easy to do it while watching rather than reading. People are always eager to know how some things are prepared & it is the reason being these kinds of videos get more traffic on the internet these days. Slideshow is another best way to create a promotional video for your blog post. It enables your users to know what you have included in your post. It gives in brief information about your blog post. Add catchy headlines & make a slideshow video of it, which should not exceed more than 1 minute. This will help the people who supposed to have no time to read the full post. From the headlines, they can get the idea about the post. These promotional videos allow people to find the important points that they want from your post. Make key points of your post that can convey the story of your post. Snapchat is also the best option to drive traffic to your blog post if you have an active audience on the Snapchat. This is just like posting a video on YouTube channel. Create a video & give a link to your post. Make sure the video should not exceed 10 seconds & you should reveal your story in these 10 seconds though the maximum limit is 30 seconds. Just include the topics you have written or want to write. e.g "A Journalist at The New York Times speaks about how people should dress for work". The ultimate aim is to reach up to them & grab their attention towards the article. 6. Promoting videos on the Instagram. Like Snapchat, on the Instagram, you can also post your content marketing videos to drive traffic to your blog post. Here the video limit is more which is up to 1 minute, means you can reveal your story within 1 minute. Make attention about your upcoming posts or include the headlines hashtags about your recent or old posts in the caption while posting it on the Instagram. Most effective and efficient way of video marketing strategy is YOUTUBE. As we know youtube is the second largest search engine in the world so a marketer can find plenty of audiences here. So create a youtube channel & use your blog post topics to create a video. The most important thing is you need to optimize your videos for the search engine so that it should rank higher in search engine results. If the "social media" is a king, then the "Facebook" is king of social media. Facebook is the most popular social media across the world & has 2 billion active users every month. So you can imagine the amount of audience you can get from Facebook. Also, the important thing to mention here is, Facebook prefers posts with video. Post a video of your blog post & ask your friends, fans, followers or subscribers to like & share. Everyone has different specialties. Someone finds it easy to shoot a video or someone finds it easy to write a blog post. Everyone can't be a perfect blogger & same way everyone can't be a perfect vlogger. So you can go a long way by helping each other & this is something you can experience by being a partner with vlogger. Here you can help them by promoting their videos to your post & they can help you by promoting your website on their video. So look out for someone whose subject resembles with your subject like if your blog relates to health, then find someone who posts a video on yoga or naturopathy. Being similar is not a compulsion but it is better for audience point of view that they will find it easy. The partnership should be clear to terms and conditions. To conclude this I can only say use one of these tricks to improve traffic to the website. You can create teasers or can create your own video. Also, the video is helpful for those people who want to read the full text but supposed to have less time because of their busy schedules or hurrying to go to work or really tired after days work. They can get it by watching these short little videos.